Parikia is the lively, picturesque capital of the island and its main commercial port. In fact, its port is a connecting hub between the western, eastern, and lesser Cycladic Islands. 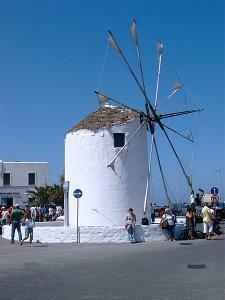 The capital has some excellent restaurants and tavernas, and a nightlife nearly rivaling that of nearby Mykonos. Parikia offers fairly decent bus connections to some of the outlying beaches south and southeast, as well as to Naoussa, the picturesque fishing village on the north coast. As with all of the larger islands, however, renting a car or bike always seems to be the best option. There is excellent accommodation to be found in this area, as well as within walking distance to it from other nearby beach resorts. Paros Parikia: The heart-shaped Bay!